Background and purpose: The MyotonPRO is a portable device that measures muscle tone and bio-mechanical muscle properties objectively. MyotonPRO has already proven to be effective in measuring muscle properties in healthy and diseased populations. However, to the best of our knowledge, it has never been tested in individuals suffering from paratonia, a form of hypertonia frequently accompanying dementia. The aims of the present study were to (1) compare muscle tone, elasticity, and stiffness between 3 different subpopulations of young and old healthy adults and individuals with paratonia, and (2) investigate the intra- and interrater reproducibility of MyotonPRO measurements of the biceps brachii (BB) muscle in each subpopulation. Methods: MyotonPRO measurements of muscle tone, elasticity, and dynamic stiffness were carried out by 2 investigators on 2 different days over the BB muscles of 54 participants (18 healthy young adults, 20 healthy older adults, and 16 older individuals with paratonia). Muscle properties were compared between subpopulations using ANOVA/Welch and post hoc tests. Reliability (intraclass correlation coefficient) and agreement parameters (standard error of measurement and the minimal detectable change) were calculated. 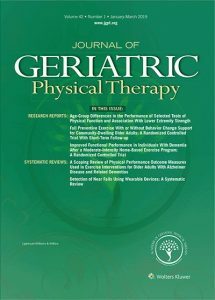 Results: Statistically significant differences between subpopulations were found in all parameters, except for stiffness between healthy elderly and individuals with paratonia. In the healthy subpopulations, (a) intrarater reliability was very high and intrarater agreement was good between 2 consecutive series, (b) between days intrarater reliability was low to high and intrarater agreement was variable, (c) interrater reliability was high to very high and interrater agreement was good. In individuals with paratonia, (a) intrarater reliability was moderate to high and agreement was variable between series, (b) between days intrarater reliability was poor to moderate and agreement was poor, (c) interrater reliability ranged from low to high with poor agreement. MyotonPRO measurements of the BB muscle showed good reproducibility in both healthy subpopulations, particularly for measurements performed within the same day. In individuals with paratonia, reliability and agreement were substantially lower. MyotonPRO can be used in clinical assessment and research. However, in individuals with paratonia, careful interpretation of results is required. Research in a larger sample of persons with paratonia at different stages of disease severity is recommended.